In Anderson’s eyes, “Paul’s letters show evidence of both a contextually determined diversity and also a coherent development through time” (p.7). This conviction enables him to say that “both ‘camps’ are right, but not all the time” (p.5). He begins Paul’s New Perspective with a survey of the sprawling landscape of recent books on Paul. Anderson’s impressive familiarity with the relevant works of well-known “new perspective on Paul” (NPP) luminaries like Sanders, Dunn, and Wright is evident. He also introduces readers to the more recent contributions of other scholars like Bird, Gorman, and Barclay. To call Anderson “well-read” seems like a real understatement, and his nuanced engagement with an intimidatingly large pile of Pauline literature is both helpful and at times illuminating. Anderson highlights a number of themes raised by the NPP that he thinks constitute real, genuine advancements in our understanding of Paul, and he has no problem praising the NPP for these accomplishments. Nevertheless, Anderson also subjects the movement to more skeptical questions and qualifications. For example, he praises the NPP for rightly emphasizing how Paul “leveraged justification toward the reconciliation of peoples into one Abrahamic family,” but he also criticizes NPP theologians for (at times) paying insufficient attention to the vertical dimension of justification (pp.382-383). I think Anderson should be applauded for his willingness to embrace and work with the strengths of the NPP, especially since he positions himself as one of its admiring critics. Anderson’s overarching thesis, broadly speaking, is that while the NPP gives a compelling reading of the early Pauline epistles (especially Galatians), its interpretation of Paul becomes progressively less persuasive in the Apostle’s later letters (p.384). Meanwhile, the “traditional Protestant perspective” (TPP)—his term for what many call the “old perspective”—fails to be consistently persuasive in its readings of the early epistles, but displays a more satisfactory understanding of Paul’s soteriology in his later letters. Consequently, Anderson believes the “besetting fault” of NPP scholars to be their tendency to read Romans through the lens of their interpretation of Galatians, while he thinks TPP adherents typically err by reading Romans according to their understanding of Ephesians (p.84). In terms of the authorship and dating of the thirteen letters traditionally attributed to Paul, Anderson is persuaded by the South Galatians hypothesis, which causes him to see Galatians as the Apostle’s earliest extant letter, written around AD 49. He sides with more conventional scholarship in dating Romans to AD 56-58 (p.164). Less conventionally, Anderson accepts authentic Pauline scholarship for all of the “disputed epistles.” It should be noted that this is something of a minority position in some of the more critical quarters of Pauline scholarship, especially with the pastoral epistles. Based on these methodological conclusions, Anderson develops his argument regarding the maturing trajectory of Paul’s soteriology, working with a thirteen-letter Pauline corpus that dates “from AD 49 to the mid-60s” (p.166). To flesh out the defining characteristics of his proposal, Anderson delves into a few “markers of the itinerary,” which for him demonstrate a traceable pattern of development in Paul’s soteriology over the course of his letters. First, he looks at the topic of “works” and “works of the law.” Anderson disagrees with the conventional interpretations of both the NPP and TPP because they both consider the two terms to be interchangeable, while he is convinced they are not. NPP scholars generally read “works” as a shorthand for “works of the law,” by which they primarily mean practices related to Judaism’s social boundaries (p.381). TPP proponents, on the other hand, see “works of the law” as a phrase that functions as a synecdoche for “works” in general, understood as “soteriologically deficient human effort” (p.381). Distancing himself with both of these positions, Anderson maintains that “‘works,’ used absolutely, marks an abstracting and generalizing development in Paul’s soteriology, from a remonstrance against Jewish particularity… to a more settled antithesis between works and grace” (pp.381-382). This “settled antithesis” leads to a similar kind of argument regarding the development of “grace” in Paul’s letters. In this area, he does well to engage extensively (and mostly appreciatively) with John Barclay’s excellent recent work, Paul and the Gift. Anderson suggests that “this incongruous grace of God takes its very particular shape as the antithesis of human accomplishment increasingly throughout the Pauline corpus… specifically in Romans and patently thereafter” (p.382). In general, Anderson believes that some scholars seek to make justification do too much heavy lifting, forgetting that Paul’s soteriology “reaches extensively and intensively well beyond the bounds of justification” (p.384). This is not to say that Anderson sides with people like Albert Schweitzer, who once described justification as being a mere “subsidiary crater” in Pauline theology (p.10). Rather, he’s emphasizing the need for justification to be seen as part of a larger, more complex vision of reconciliation and salvation (pp.388-391). In regards to this part of his thesis, I’m in agreement, but I do wonder how much this conclusion can be described as being similar to the TPP’s reading of Paul. This may be an area where Anderson’s approach to Paul is relatively unique. Interestingly, Anderson believes both that participatory union with Christ is the “red thread of Pauline soteriology” and that justification itself should nevertheless be regarded as broadly—if not strictly—forensic in nature (p.391). Hence, he calls justification “the forensic dimension of Pauline soteriology.” It’s interesting to place this dimension of Anderson’s work in conversation with the writings of Michael Gorman, another Pauline scholar who highlights the theme of participation in Christ. Though they both regard union with Christ as a central thread, Anderson parts from Gorman by understanding reconciliation to be a fruit of justification rather than a part of it (p.327). Gorman, on the other hand, writes that, “The terms ‘justification’ and ‘reconciliation’ are… essentially synonymous for Paul” (Inhabiting the Cruciform God, p.56). It seems to me that Gorman bases this conclusion on a differing reading of Romans 5 and by placing more emphasis on the covenantal dimension of justification, among other things. The important result of this analysis, for our purposes, is that both agree that reconciliation is a relational metaphor, but differ on how that impacts the nature of justification. By viewing reconciliation as part of justification, it is obviously easier for Gorman to conclude that justification itself possesses a significant participatory dimension. Regardless of the disagreements I may have with aspects of Anderson’s proposal, I suggest that this statement hits the nail on the head. To summarize, Anderson proposes a developmental thesis in Paul’s New Perspective. 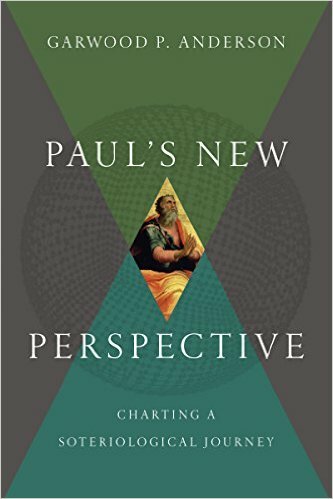 He sets out an argument that seeks to demonstrate that “the new perspective on Paul is Paul’s oldest perspective… and the ‘old’ perspective describes what would become (more or less) Paul’s settled ‘new’ perspective” (p.379). By development, he means “traceable change that happens over time, resulting in a trajectory” (p.157). I’m not the only one to make this observation, but one of the vulnerabilities of Anderson’s ambitious proposal is that it depends (maybe more than he would like to admit) on a set of presuppositions regarding the dating and authenticity of Paul’s letters. If one doesn’t share his views on these methodological issues, his thesis becomes less plausible. For example, if the South Galatian hypothesis was demonstrated conclusively to be wrong, resulting in a noticeably later dating of Galatians, then that would make his developmental hypothesis at least somewhat less likely. I don’t think this is necessarily a fatal flaw in Anderson’s proposal, but it’s obviously worth keeping in mind. I also can’t resist adding that one notices an absence of serious engagement with the “apocalyptic” school of Pauline interpretation, though that may beyond the scope of this work. Anderson believes that the TPP gives a better reading of Paul’s later letters, and describes himself as “almost…but not quite” convinced by the NPP (p.56). I feel the same way about his overall proposal. It’s very thorough, ambitious, and theologically rich, and I appreciate his emphasis on union with Christ as a central category for Pauline soteriology. I also am impressed with his evenhandedness and charity in how he engages with differing perspectives. Nevertheless, I remain somewhat more persuaded by the NPP than he is, for whatever it’s worth. Paul’s New Perspective truly is a fresh proposal for getting beyond the debates between the NPP and TPP, and it hopefully will at the very least cause other scholars to look afresh at the possibility for development in Paul’s theology, even if they hesitate follow all the details of Anderson’s proposal. This is definitely a book well-worth reading with much to appreciate, regardless of which Pauline camp you ultimately favor. *Disclosure: I received this book free from IVP Academic for review purposes. The opinions I have expressed are my own, and I was not required to write a positive review. This entry was posted in Book Reviews and tagged Garwood P. Anderson, Interpretation, Justification, Michael Gorman, New Perspective on Paul, Old Perspective on Paul, Participation, Paul, Soteriology, theology, Union with Christ by joecrow91. Bookmark the permalink. Thanks for the very substantial review. The relationship of the book’s developmental hypothesis to its critical judgments is a fair question to raise. Appreciated. Thank you for the kind feedback, Dr. Anderson.